The Blaenafon Community Heritage and Cordell Museum is situated in the world heritage site of Blaenafon. 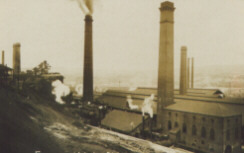 The Museum was established to ensure that the history of Blaenafon’s industrial past would not be forgotten, many of the items on display were donated by members of the local community. On display in the museum are a number of exhibits to guide visitors through the highly interesting history of Blaenafon from the beginning of the Industrial Revolution right through to the present day world heritage site. Amongst the artefacts, which the museum holds, are a large collection of photographs and books, furniture and military uniforms. Within the Blaenafon Community Heritage and Cordell Museum is the Blaenafon Community Archive, which is a digital library of historical photographs of the town and its people. Also on offer for researchers are a number of books on the history of Blaenafon. The Blaenafon Community Heritage and Cordell Museum is open Monday to Thursday 10:00-4:00, and also Saturday 10:00-1:00, between April 1st to September 30th. From October 1st to March 31st it is open Monday, Tuesday, and Thursday 10:00-4:00, and also on a Saturday 10:00-1:00. This archive entry was last updated on 14 March 2017. Information incorrect or out-of-date?